When Benjamin Pollard (my 3x great-grandfather) died in 1915 at ‘Sunrise View’ near Dalton, New South Wales, he had recorded a remarkable statistic; fathering 26 children. Perhaps even more remarkable is the fact only one of the 26 children died in infancy; even with a serious diphtheria outbreak in the area which claimed many young victims in the early 1860’s. Benjamin had arrived in Australia when he was four years old. His parents, William Pollard and Lucy Pollard (nee Wheatley) were bounty immigrants who brought their three children out to New South Wales on the Duchess of Northumberland, arriving in 1838. His mother, Lucy was sister to John Wheatley the Methodist preacher who would become well known in the Gunning district (see; Three Wheatleys). 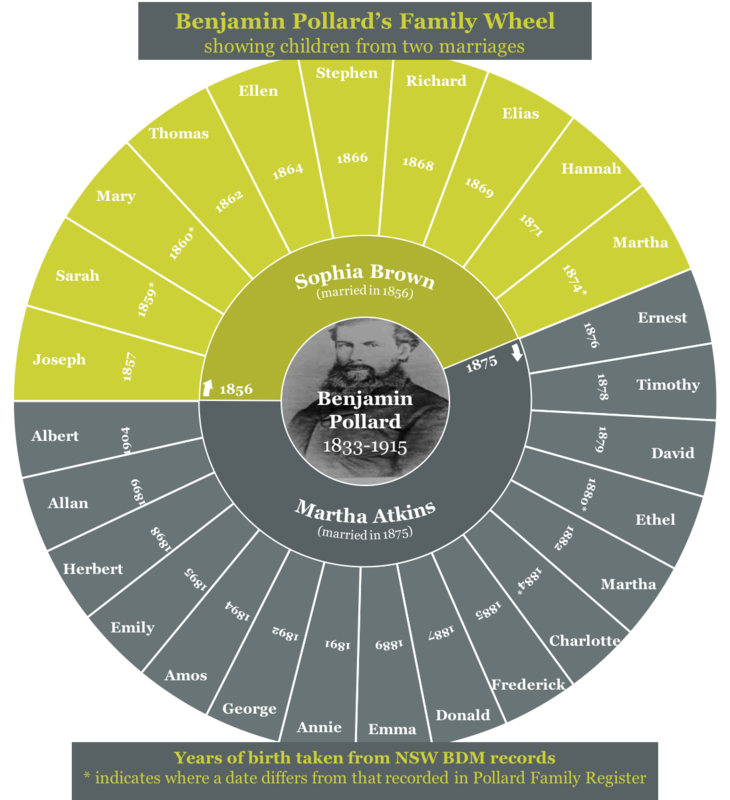 This senior Pollard couple had further children once in New South Wales but Benjamin was their only son. The family first settled at ‘The Oakes’ near Camden before relocating to Jerrawa by bullock waggon in the search for land of their own. Father William and son Benjamin had both purchased land at Jerrawa by 1856. While living here it is alleged (in an obituary of Williams daughter Ellen Pollard nee Ginn) that father William was held up by bushrangers when traveling to Yass to pay for his Jerrawa land purchase. The story goes that the bushrangers “demanded money, only to receive a ‘not negotiable’ cheque, which they returned in disgust to the rightful owner” (Goulburn Evening Penny Post, 1934). It was in that year 1856 that son Benjamin married his first wife Sophia Brown. Benjamin was 22 years old at the time of the marriage, Sophia was 17. Sophia was the daughter of ‘Old Tom’ Brown who had travelled on the same ship, the Duchess of Northumberland, to Australia and who also settled near Jerrawa on the Oolong Creek (now Dalton). Old Tom Brown was also the protégé to Benjamin’s uncle (his mother’s brother), John Wheatley. Old Tom Brown had been converted to the Methodist Church via John Wheatley’s preaching back in England (more on this in a later post). It appears that Benjamin and Sophia lived all their lives together on Catherine’s Creek, near Jerrawa, where they had 10 children, losing only their last in infancy (8 months after birth). It appears that this last birth may have had complications for mother Sophia also, as she died just four weeks after giving birth in July 1873. Her death certificate is difficult to interpret but it appears, whatever the primary cause of death, there was also secondary disease that contributed to her early death, namely Typhoid fever. Sophia’s death left Benjamin Pollard alone with his 9 children and the new baby which unfortunately dies just seven months after her mother of diarrhoea. This was a dark period for the Pollard family with Benjamin’s mother, Lucy, also dying in January 1874 (6 months after Sophia and 2 weeks before baby Martha). I have wondered about the name of this last, lost child, Martha Sophia Pollard. There was another young girl living in the district named Martha whose brother (Thomas Atkins) owned land at Jerrawa, that shared a boundary with Benjamin Pollards. It was probably just coincidence, but perhaps Benjamin may have had some level of affection for Martha Atkins which may have inspired him to suggest this name for his last child. After Sophia and young infant Martha died, Benjamin remarried this Martha Atkins who was only 16 at the time. Benjamin was now 41, an age difference of 25 years. Martha Atkins’ parents (John Atkins and Emma Plumb) were married in Queensland and later moved to Luddenham, near Penrith. Her father John died six months after Martha was born, aged 28. Martha’s mother, Emma remarried Ambrose Alchin (one of the earliest Dalton pioneers and the adopted father of my 3x great-grandfather, John Alchin/Gaynes). I do not know if the marriage between Martha and Benjamin Pollard had the blessing of Martha’s mother, and I am personally unsure how much a 16-year-old can rationally consent to mutual marriage with someone 25 years their senior. I understand that these were different times, but still I remain sceptical when partnerships appear to have unequal balances of power. Perhaps it was simply a case of mutual affection or love or perhaps Benjamin acknowledged that he would need help raising his large family and looked to the surrounding district for a suitable partner. There is also a tradition in this period where mothers would marry off their young daughters to ease the economic burden in the family home when times were tough. This may have been the case with this marriage as Martha’s mother, Emma had just married into a family and had taken on the responsibility of stepmother to her husband’s seven children, three of which were still under 21 (as well as having three children of her own). When Martha and Benjamin married, Martha would have been only one year older then Benjamin’s oldest son, Joseph (15 at the time). The couple were married at ‘Echcol’, the farm that bordered Martha’s step-dad, Ambrose Alchin’s original selection on the Oolong Creek. This couple went on to have 16 children, an increasable feat for the period and one that equals the largest family alive today in Australia. In 1883 Benjamin advertises three farms for sale in Jerrawa, however he must have retained land for himself as the 1885 censes records him as still living at Jerrawa on 60 acres and having; 6 horses, 2 cows and 3 pigs. Martha was 45 years old, Benjamin 70, when their last child, Albert was born. For Benjamin, it was an impressive 47-year span between his first child (to Sophia) and his last (to Martha). Benjamin and Martha did not lose any of their children in infancy, but they did lose one son at age 10 and two sons much later to freak train accidents,George at the Exeter train collision in 1914 and Ernest at Lidcombe in 1927. Benjamin died in 1915, his death notice in the Goulburn Evening Penny Post on 16 April, 1915 reports that he was a long term Jerrawa resident, living there for 55 years. 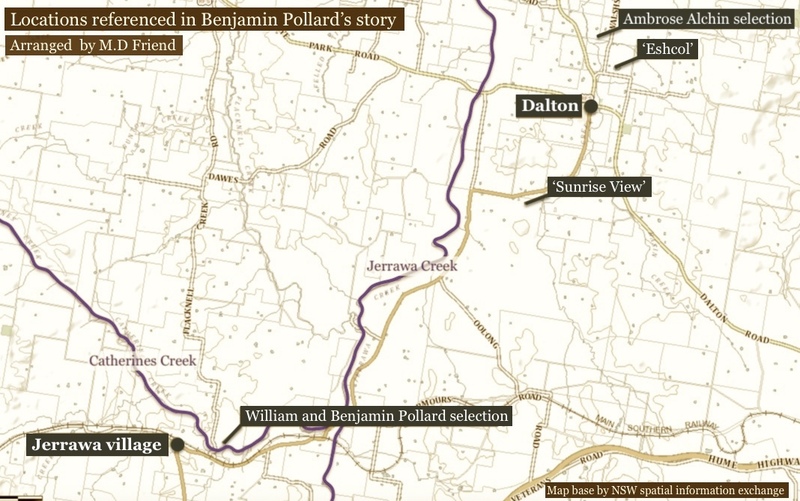 According to his death certificate, Benjamin did not die at Jerrawa, but rather at ‘Sunrise View’ near Dalton. At the time, this property was the home of Jonathan Holgate who had married one of Benjamin’s daughters (Hannah Elizabeth Pollard). If the paper’s report of Benjamin being a Jerrawa resident for 55 years are correct, and if it is the case that he was in Jerrawa by 1856, then only 4 years are unaccounted for. It may have been that Benjamin and Martha moved sometime around the year 1911 to be cared for by Hannah and Jonathon Holgate at ‘Sunrise View’ in their old age. Perhaps Benjamin just happened to be at this property at the time of his death and it was therefore the location at which his death was declared and recorded. When Martha dies in 1919 she is noted as being at Jerrawa, not Dalton or ‘Sunrise View’. Sunrise View is now part of the farm managed by my paternal family, the Friends. (See more on ‘Sunrise View’ and the Holgate connection here). The Pollard family burial plot at the Dalton General Cemetery is in a sad state, but contains the remains of Benjamin and Martha Pollard, and some of the Pollard children including Thomas, George, Amos and other close relatives. It is likely that Benjamin’s first wife, Sophia and her last child Martha Sophia are buried nearby this family plot. They are both recorded as having been buried in the Wesleyan/Methodist part of the cemetery, however her exact resting place is unmarked. Comments, corrections, questions or elaborations? Please comment below or get in touch. Mrs Ellen Ginn; Goulburn Evening Penny Post, 1934,22 May,p.3. Benjamin Pollard (death certificate); ref#7743/1915, NSW Birth, Deaths and Marriages. Sophia Pollard (nee Brown) (death certificate); ref#7515/1873, NSW Birth, Deaths and Marriages. Martha Pollard (nee Atkins) (death certificate); ref#1919/5401, NSW Birth, Deaths and Marriages.